The perfect assistant to at-home chefs, the K7 single-handle semi-pro kitchen faucet boasts pro-style functionality in an industrially chic design. Standing 26-1/2 inch tall, it makes a statement in any kitchen in both presence and usage. A key highlight is a professional spray head that pulls out and can be manoeuvred 3600 for wide coverage. Locking spray control and a push button allow users to transition easily between stream and spray modes, and GROHE SpeedClean keeps the spray nozzles free of lime scale buildup. When not in use, the spray head is held in place with an arm that swivels 1400. A GROHE SilkMove for a lifetime of smooth operation cartridge in the lever handle ensures smooth, precise control of the water temperature and volume. K7 has a flow rate of 1.75 GPM and is available in durable SuperSteel InfinityFinish. This Purist Rite-Temp bath and shower trim maintains desired water temperature +/-30F while displaying a modern, minimal design to complement the entire Purist collection. Premium material construction and a one-piece ceramic valve offer durability and reliability. The high-temperature limit stop, available on single-handle bath and shower faucets, provides added safety. Meets ADA requirements. Cruette 1 or 3-Hole Single-Handle Pull-Down Sprayer Kitchen Faucet In Oil-Rubbed Bronze The graceful elegance of the Cruette faucet is ideal for traditional kitchens. Its high-arch spout effortlessly clears the largest pots, and a pull-down sprayhead allows you to target the water where you need it for easy prep and cleanup. Sweep spray creates a wide, forceful blade of water for superior cleaning. Kohler's new docking system, DockNetik, secures the pull-down sprayhead to the spout using magnetic force. 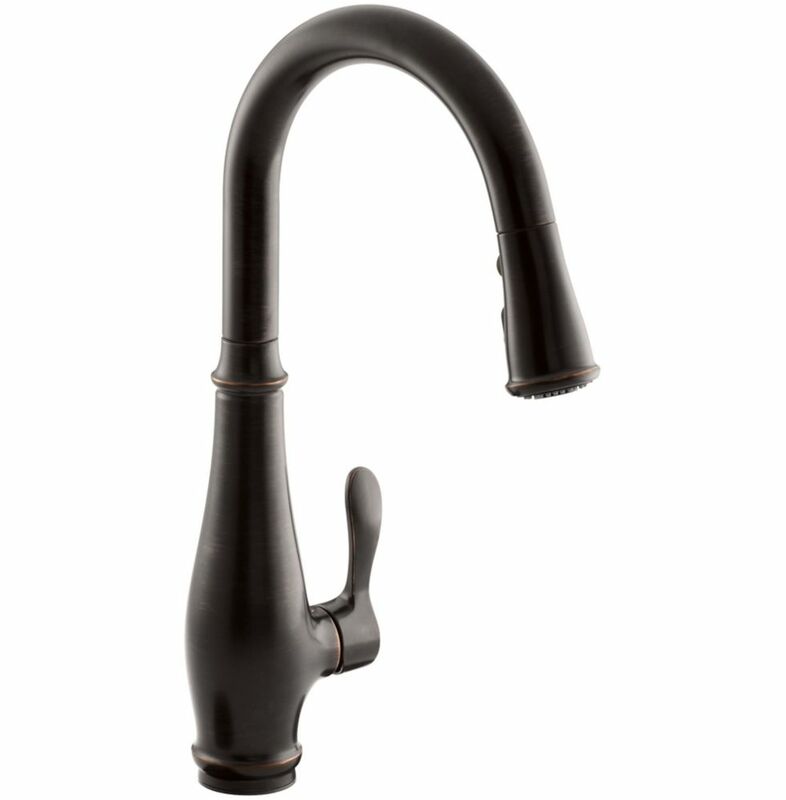 Cruette 1 or 3-Hole Single-Handle Pull-Down Sprayer Kitchen Faucet In Oil-Rubbed Bronze is rated 4.8 out of 5 by 11. Rated 5 out of 5 by Cole from Nice finish with a quality feel. Sweep spray feature is... Nice finish with a quality feel. Sweep spray feature is great for pre-wash rinsing and sink cleaning. Valve operation is very smooth and the pull down sprayer retracts with ease. Installation is straight forward and quick with easy to follow instructions. Rated 4 out of 5 by Switchman from Was easy to install and works well. Its motion from side to side works smooth but develops a smal... Was easy to install and works well. Its motion from side to side works smooth but develops a small hitch in its movement if it sets idle for a period of time. Very small but noticeable. The pull down sprayer works very nice and appearance was nicely finished. Rated 5 out of 5 by Anonymous from Kitchen faucet Love our new faucet! The sweep spray feature is very cool. Rated 4 out of 5 by NaZdrowie from Great faucet - Built to last - Spout just too tall for our kitchen This faucet was built to last. Very sturdy. Loved the sprayer and its settings. Also loved the look of the oil-rubbed bronze. However, we did end up returning it simply because the spout was too tall for our liking (the spout height is a bit over 10"), and we prefer a shorter spout (went with one about 8"). Just personal preference, but it seemed out of place for our kitchen design. Cannot comment on the installation since we had a plumber install it during other plumbing work. Rated 5 out of 5 by Remodeler from Very satisfied Great faucet. It feels solid and has been performing quite well. The options on the pull-down are a nice addition. Installation was easy although the plastic ring at the base breaks easily. Caulked with silicon and have had no leaks whatsoever.